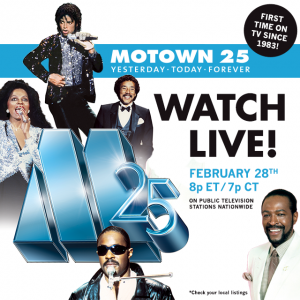 The historic “Motown 25” concert will be airing on TV later this month for the first time since its 1983 debut. The landmark TV special that featured the world premiere of Michael Jackson’s moonwalk, reunion of The Supremes, The Miracles or The Jackson 5 will be broadcast on February 28th as part of public televisions’ celebration of Black History Month. Music lovers and pop culture aficionados alike will have the opportunity to see magic and history being made as the Emmy® Award-winning program will air exclusively as a fundraising event on public television stations this February and March, marking the first TV broadcast of the concert since its debut more than 30 years ago. It will make its national public broadcasting premiere on February 28 at 8pm ET & PT/7pm CT, with repeat broadcasts throughout March. Produced by Motown Productions with Suzanne de Passe, Don Mischer and Buz Kohan, “Motown 25” was taped before a live audience at California’s Pasadena Civic Auditorium and showcased virtually every Motown artist from the company’s inception, including Michael Jackson, Marvin Gaye, Smokey Robinson, Stevie Wonder, Diana Ross, The Supremes, The Jackson 5, The Miracles, The Temptations, Four Tops and many others. The show also featured many guests outside the Motown Records sphere who had been influenced by Motown artists, including Linda Ronstadt, who performed a memorable duet with Smokey Robinson, Billy Dee Williams, Jose Feliciano and British new wave star Adam Ant, who was riding a wave of popularity from MTV exposure. As an added highlight, the historic evening was hosted by Richard Pryor, who was arguably the hottest comedian in the world at the time. A seminal event in pop culture history, this concert event, which would capture the Emmy® for Best Variety Program and a George Foster Peabody Award, would establish the gold standard for all future televised concert events and go on to provide the backstory for the Tony®-nominated Broadway play, Motown The Musical. “With the popularity of ‘Motown: The Musical’, which continues to open in major markets across the U.S., and the program’s recent success on DVD, there’s never been a better time to re-air the original broadcast“, says Suzanne de Passe, the Executive Producer of the TV show. “Whether you’re discovering that incredible night of music for the very first time, or are huge fan of Motown whose been eagerly awaiting the show’s return to TV, ‘Motown 25’ offers a lifetime of magic and memories for everyone“.